Former Zanu PF national political commissar Saviour Kasukuwere is said to have been placed on the “persons of interest” list by the Zimbabwe Republic Police (ZRP). While the Daily News could not immediately establish the reason behind the renewed police interest in him, the former Local Government minister is viewed with suspicion by the new administration of President Emmerson Mnangagwa due to his closeness to former president, Robert Mugabe. Labour minister Patrick Zhuwao fearing for their lives. At the time, the military had launched what they called Operation Restore Legacy, which targeted “criminals” around Mugabe. Mugabe has refused to recognise Mnangagwa’s government, saying his removal was an illegality. While police spokesperson Charity Charamba told the Daily News that she was not aware that Kasukuwere had been placed on the “persons of interest” list, authoritative ZRP sources said the former Zanu PF honcho has been under their radar since June 23, when a bomb exploded at White City Stadium in Bulawayo, killing two people, and injuring more than 40 others. The bomb blast left a trail of destruction, leading to the hospitalisation of a dozen of Zanu PF officials and scores of the ruling party supporters. Mnangagwa, who survived the blast, claims it could have been the work of his internal enemies in the Generation 40 (G40) faction, which fiercely and unsuccessfully fought to derail his presidential ambitions, and caused his dismissal from Zanu PF and government early November 2017. 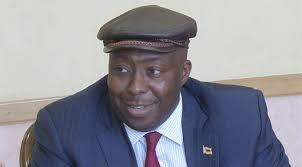 A combative politician also known as “Tyson”, Kasukuwere is one of the G40 kingpins. A few days after the Bulawayo incident, law enforcement agents forced their way into Kasukuwere’s mansion, combed the house but maintained a veil of secrecy over their investigations. The 47-year-old politician, who returned home in May this year after six months in exile, has been conspicuous by his absence since the raid. Sources said he left the country for South Africa immediately after the ZRP descended on his palatial Borrowdale home. “Kasukuwere has become very unease about his safety since the raid, which apparently happened a few days after the Bulawayo bombing incident. It also came a few days after the courts dismissed his border jumping case,” said a family source. “For now, it is still not clear if he will come back”. The term “person of interest” is generally used to identify an individual whom the police are interested in, either because the person is cooperating with the investigation, may have information that would assist the investigation, or possesses certain characteristics that merit further attention. Unlike “suspect” and “material witness,” a “person of interest” has no legal definition. It’s a phrase whose usage dates back to 1986, when police in the United States coined it during an investigation. Critics complain that the term has become a method for law enforcement officers to draw attention to individuals without formally accusing them. Kasukuwere’s brother Dickson Mafios said the former minister was away on business and “he is coming back next week” because “there is nothing for him to fear back home”. The lower courts acquitted the former Cabinet minister last month after he had been charged with border jumping.